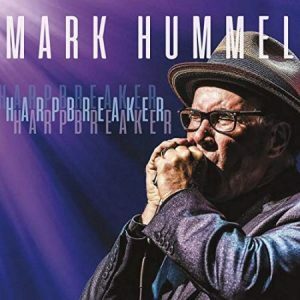 Grammy nominated blues harp player Mark Hummel has worked with many of the greats but mostly known for his work with his band The Blues Survivors and his producing the Blues Harmonica Blowout Tour which has featured harp legends such as James Cotton, Carey Bell and Charlie Musselwhite. 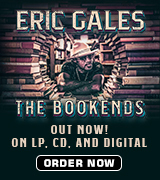 He is proficient in all kind of blues styles and this CD showcase is all instrumentals including a couple of jazz tunes. His third-position for three of these tunes are textbook examples of how freeing this less used full-step down from the key you are playing in harp position which gives off a sorrowful minor jazzy sound. For example if one is playing in E the harp that is blown would be a D harp. The rest of the 13 tracks here are played in cross-harp position which is a fourth up from the key one is playing in and the blues standard. For example if one is playing in E the harp blown would be an A. The only exception is “Chuckaluck” played on the Chromatic harp I believe. The first position is what is commonly called straight harp and it is most used in country tunes such as “Oh Susanna” where the key you’re in is the key harp blown. Lesson finished. So what is this no vocals harp compilation all about? First off there are so many great players supporting Mark. On guitars are legends Anson Funderburgh; Chris “Kid” Anderson (a blues cat from Finland who also produces much of this album at his famed Bay Area Greaseland Studios); Billy Flynn, Rusty Zinn and Little Charlie Baty from the original Little Charlie and the Nightcats. Rick Estrin & the Nightcats have recorded all three of their post-“Little Charlie” records at Greaseland. To round out the stellar band is R.W. Grigsby on bass and Wes Starr on drums. As great as the side players are, making the scene and setting the stage, they never go out and steal the show. This is a soloist’s showcase from beginning to end and to the last tremolo licks it’s the harp that we’re being fêted with. The highlights here are many and there is much to be gleaned from these selections. Mark opens with a barn burner original showing he can compete at the highest level. The next “The Creeper Returns” by Little Sonny (Aaron Willis) is faithful to the original 1970 release on Enterprise/Stax Records and is the first played in third-position. The listener is immediately introduced to the distinct minor sounds the position is famous for. Next up is an out-of-the-box Buddy Rich big band style tune but Mark knows exactly how to bring it on home. Mark’s magnum opus here and the favorite tune of his mom’s is “Cristo Redentor” another third-position wailer goes the distance at over 7 minutes without ever losing the edge necessary to keep the listener fully engaged and interested in the trails he takes you down. The third third-position is Horace Silver’s “Señor Blues” a jazz standard and for the harp aficionado a real treasure. There is a lot to learn and enjoy on this CD. 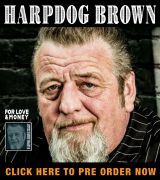 If one modern blues harp CD can hit all the right notes on the way from “Harpoventilatin’” to the Ma Rainey traditional “See See Rider” without a misstep then you got it all right here. The penultimate Muddy Water’s “Evan’s Shuffle” makes the cut along with Muddy’s former harmonica player Little Walter’s “Crazy Legs” kicking up some serious old time Delta Blues dust on the former and Urban Chicago grit on the latter. This is the album for the beginner all the way to the master to get their lips wet touching on all things great about the electric harp and beyond.